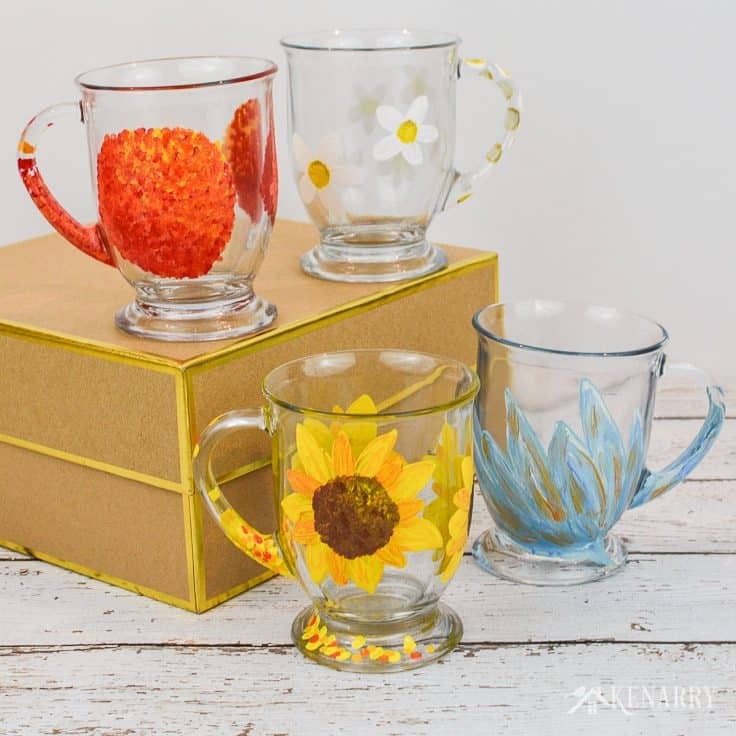 Creating your own DIY coffee mugs with gloss enamel craft paints is easy and fun – plus they make great gifts too. This step-by-step painting tutorial will show you everything you need to know. Hey there! 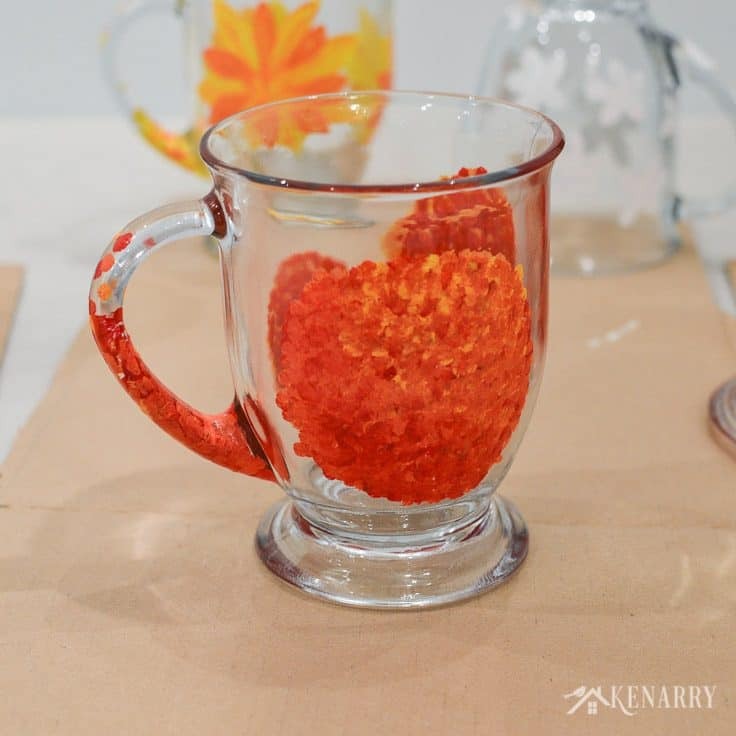 Today we’ll show you how to paint your own DIY coffee mugs using gloss enamel craft paints. 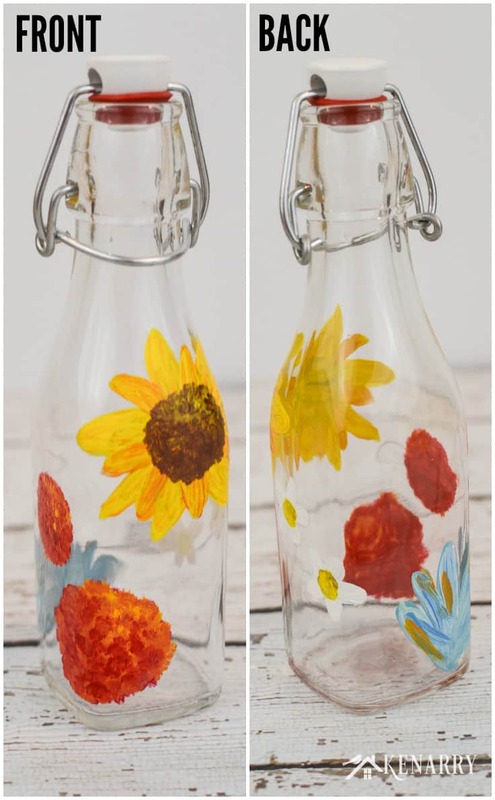 This hand painted craft idea is easy to do. Plus the finished coffee cups are dishwasher safe. They make a great gift for Valentine’s Day, Mother’s Day, birthdays and Christmas too! As you may know, I’m one of the original founders of Women’s Service Day, an annual event in West Michigan. It’s a one day service project where volunteers offer their time, skills, and talent to nonprofit organizations and also network among women in the community. This past fall, we organized the 16th annual event on October 5 with over 180 people participating. Volunteers helped with tasks like cleaning, painting, staining, cooking, landscaping, construction, assembling, organizing and making a difference in our local community. Sixteen years ago, when we started the event it was our goal to find a dozen colleagues to help with a women’s build at Lakeshore Habitat for Humanity. We had 50 women sign-up to volunteer that year so we needed to expand our volunteer efforts to other agencies where people could meaningfully serve women and children that day. The positive response that first year and the continuous spirit of giving in the years that have followed are what’s kept this event going year after year. Over the last 16 years, I’ve had many different responsibilities on the organizing committee including agency coordination, volunteer registration, social media management and photography. While I chose to make this 16th event my final one on the core organizing/planning committee, I’ll continue to be involved in other supportive ways. This special day is so near and dear to my heart! For example, this coming year I’ll likely just help with preparing and serving food for the luncheon that occurs mid way through the day. I’ll probably also create something for the raffle that occurs during the luncheon like I’ve done in past years. 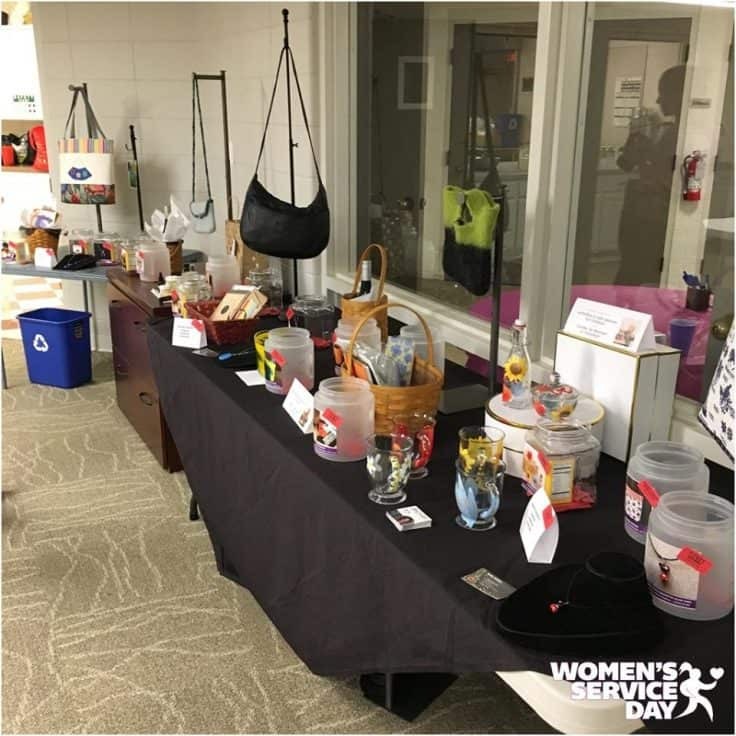 The raffle features handmade crafts, art and donations from area businesses to raise money for a specific project or organization in our community. Several years ago, I made a red, white and blue burlap wreath for the raffle. Then for two years, I painted wine glasses and appetizer plates for the raffle using gloss enamel craft paints. I first learned how to paint wine glasses at a surprise craft party my Women’s Service Day friends threw for my 40th birthday. It’s quickly become one of my favorite kinds of crafts to make since it’s simple and easy to do. One set of hand painted wine glasses and appetizer plates I made for a raffle had silly phrases like “fill ‘er up”, “cheers” and “feeling wine-y”. 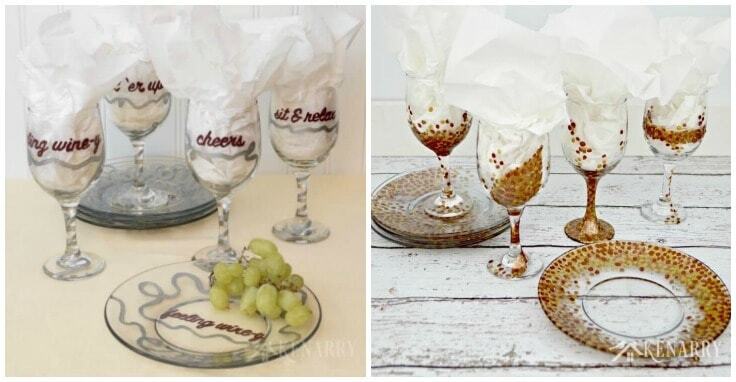 Then the next year I painted wine glasses and appetizer plates for fall using metallic enamel paints. For the most recent event we had last October, instead of doing wine glasses and plates again, I decided to hand paint DIY coffee mugs. I gave each one a unique floral design using colorful gloss enamel paints. Then I also painted a cute little cream and sugar set that combined all the floral designs. I especially love that the gloss enamel paints are dishwasher safe! 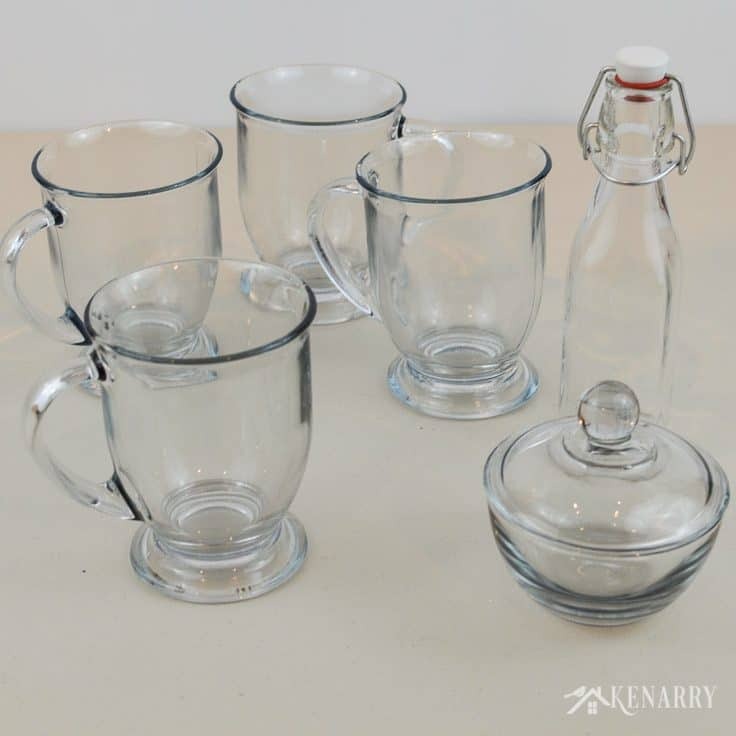 Clear glassware is inexpensive and you can find it at any local department store or online. This makes it a great low cost gift to make for Mother’s Day, Christmas, birthdays, teacher appreciation and hostess gifts. Remove any stickers from the glassware. Wash and dry it thoroughly so you have a clean surface for painting. I used Goo Gone to remove any sticky residue. Then I ran the coffee mugs, bottle and sugar bowl through my dishwasher. 2. 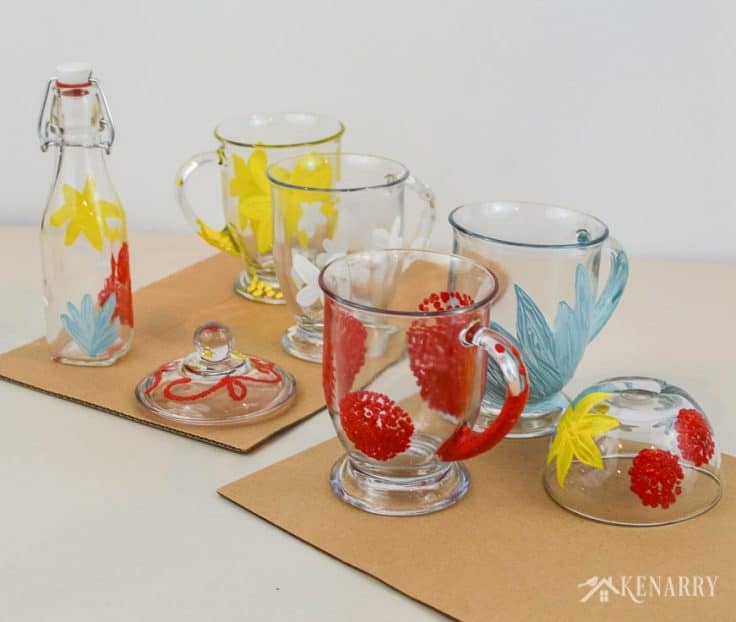 Decide what kind of design you want to paint on your glassware. For mine, I created different floral designs on each of the DIY coffee mugs. When people are having breakfast or brunch together, they like to know at a glance which coffee mug is theirs. In addition, it’s much easier and less time consuming to create unique designs than to painstakingly try to hand paint the exact same design across all the coffee mugs. Then for the coffee creamer bottle and the sugar bowl with the lid, I decided to paint a combination of all the flowers from the coffee mugs. With the DIY coffee mugs, it’s important to leave at least a half inch at the top of the glassware free of paint. While the gloss enamel paint is technically non-toxic, you don’t really want your mouth coming into contact with it. 3. Paint the first layer on the glassware. Pick one of the enamel paints to start with and pour a small amount in your paint palette. 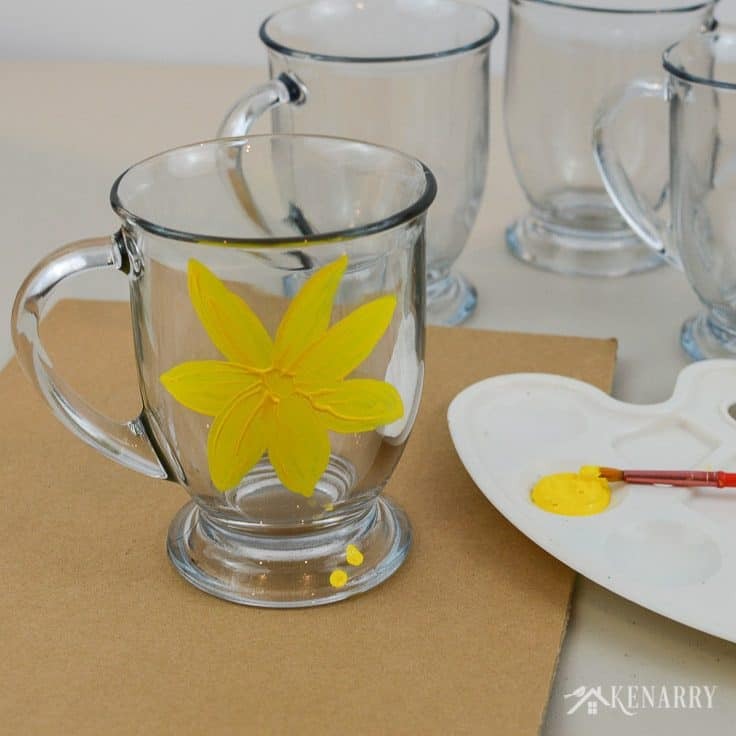 Next, use a paint brush to create a simple flower design on one of your DIY coffee mugs. 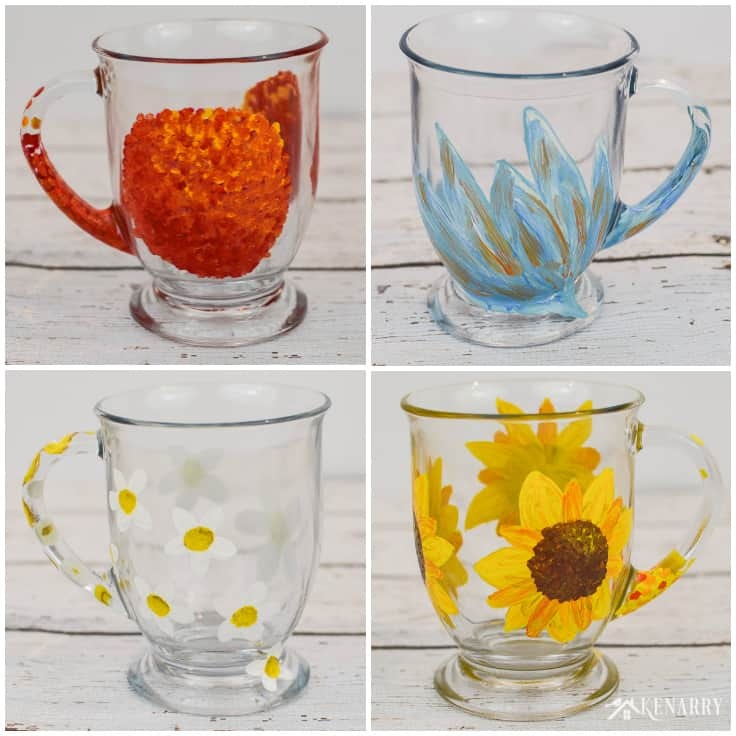 Create a base layer of paint for flowers on the other coffee mugs. Then let that first layer of paint dry for several hours. 4. Paint additional layers on the DIY coffee mugs. 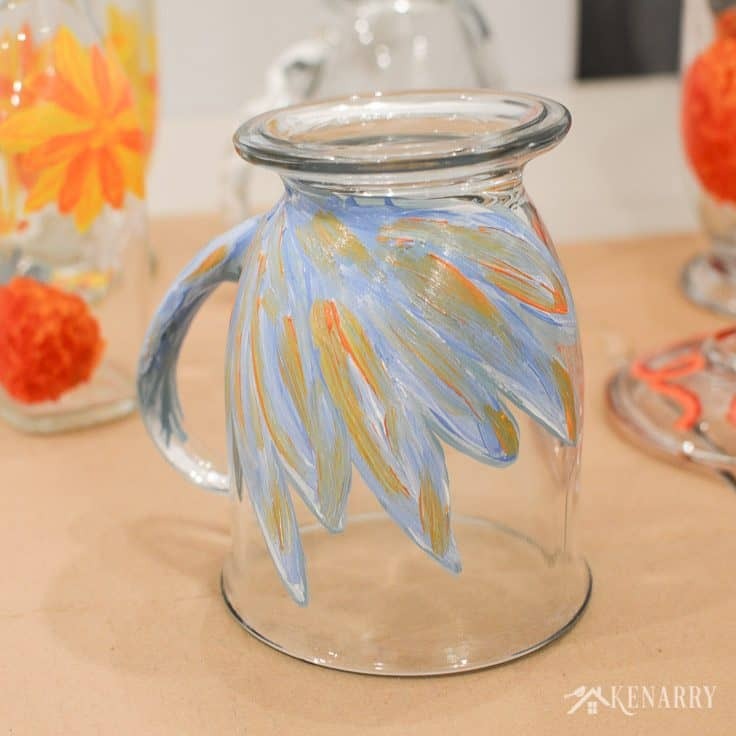 Use additional colors of gloss enamel paints to create your floral designs. For example, here’s how I painted the sunflower coffee mug. I painted two layers of simple yellow petals and let those dry. Next I added a lot of orange paint to every other petal, and a little bit to the rest of the petals. And let that layer dry too. After that, I topped the orange petals with more yellow paint. I kept this layer very thin so you could still see some of the orange streaks through the yellow. Once that dried, I used the rich espresso metallic gloss enamel paint to make dots in the center of the flower. Then last I combined lots of different dots of rich espresso and gold metallic gloss enamel paints as well as some dots of yellow to give the center of the flower a shiny stippled effect. You’ll see I added a little extra yellow on the upper right to give the design a little highlight. 5. Paint the remaining DIY coffee mugs. Get as creative as you want with your flower designs! There’s no right or wrong answer here as long as you only use gloss enamel paints. You can even mix in metallic enamels like I did. 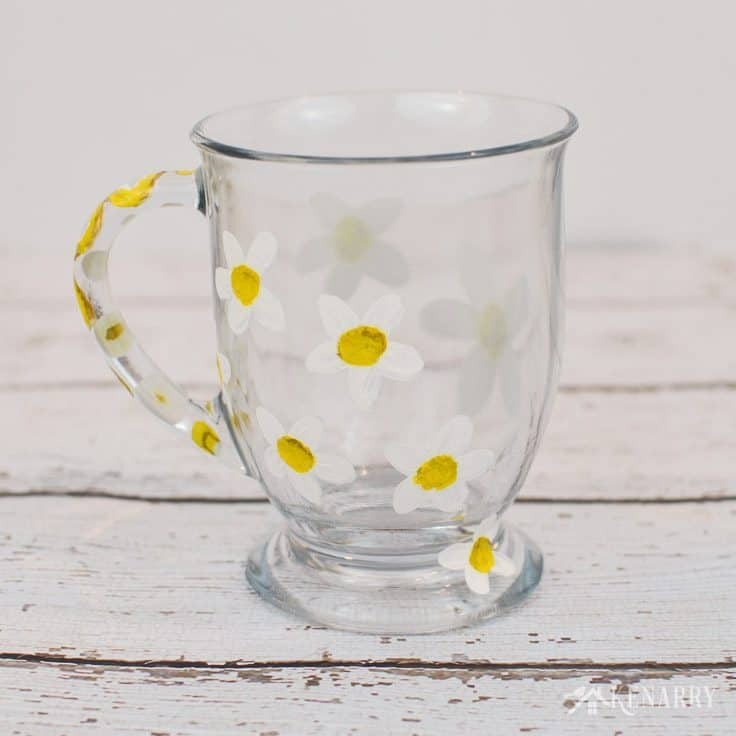 For example, I used a few little gold metallic dots in the center of the flowers on the white daisy mug. 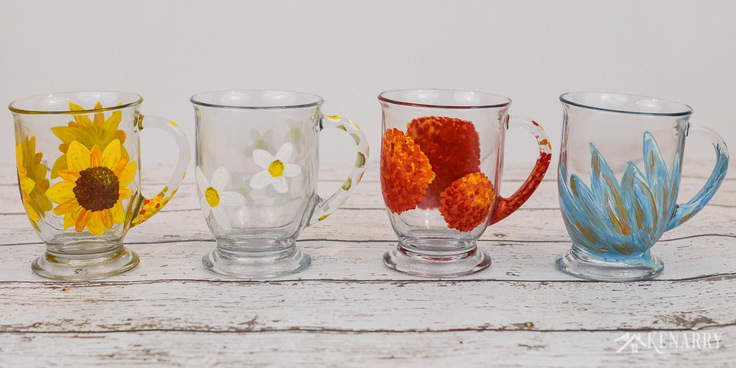 For the red mug, each of the flowers is just a series of red, orange and yellow dots. Like the center of the yellow flowers on the sunflower mug, I added more yellow to the upper right of each flower to give it a sun kissed or highlighted effect. For the blue mug, I mixed blue and white enamel paints together to create more of a cornflower blue color. On the base layer, I painted long pointed petals stemming from the base of the handle on the DIY coffee mug. To create subsequent layers, I used white, orange and more of the cornflower blue paint to streak each of the petals. 6. 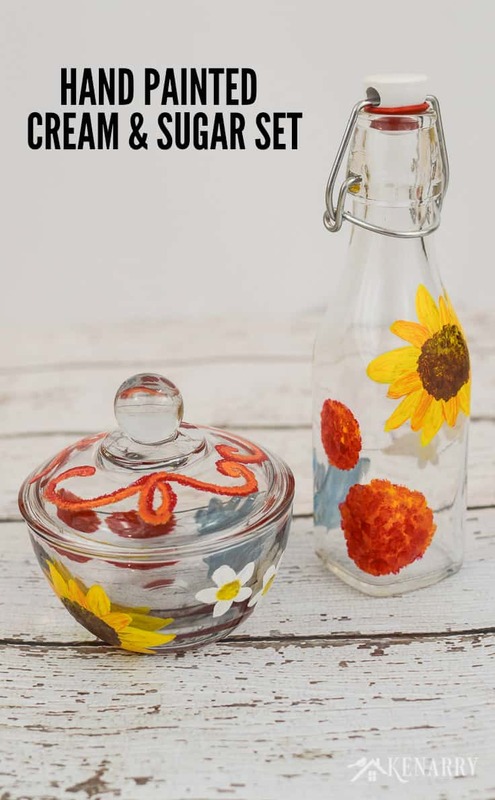 Paint the sugar bowl and coffee creamer bottle. As I painted the layers on each of the mugs, I also painted a version of that flower on the sides of the sugar bowl and around the coffee creamer bottle. This way the whole set coordinates if someone puts them out for guests when they’re serving coffee. 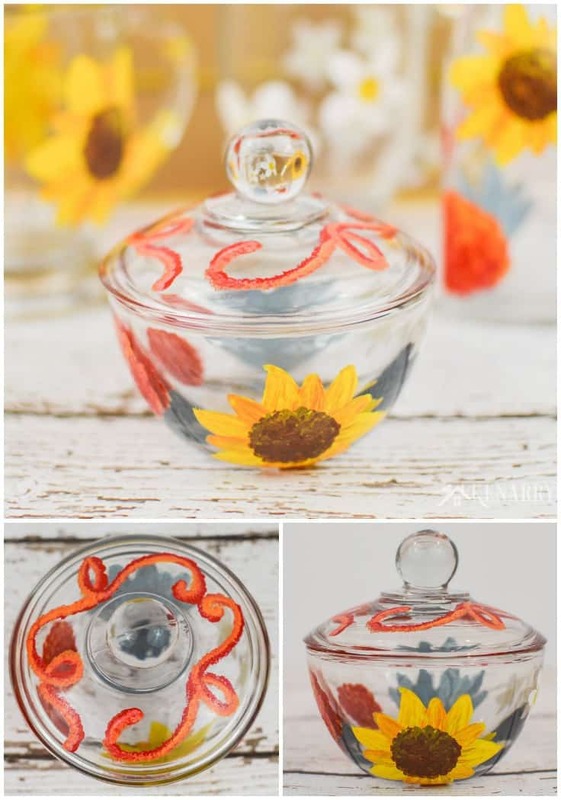 On the top of the sugar bowl lid, I painted a whimsical ribbon using red, orange and yellow paint. I sort of just dotted the paints on in a curvy line starting with the red paint. After that layer dried, I painted orange dots, then the yellow dots. I did not let the paint dry between the orange and yellow layers. This way they could intentionally blend together on the lid. 7. Allow your glassware to dry. You may need to use several coats of paint to get the desired coverage you want on the glassware. Be sure to allow enough time for your coffee mugs and glassware to dry between coats. You can also use a blow dryer to speed up the drying process. Basically I left this glassware on a table in my craft room over the course of a week. Then each afternoon, I’d pop in there to add a little more paint to each of the pieces. I kept working away at it until I was satisfied with the results. 8. Cure the paint on the DIY coffee mugs. Method 1: Air Dry. Let the coffee mugs and other glassware air dry for 21 days. Method 2: Bake in the Oven. If your creamer bottle has a plastic stopper type lid like mine did, be sure to remove it before starting this method. Put the coffee mugs, sugar bowl and creamer bottle on a metal baking sheet. Place it on a low rack in the oven. Heat the oven to 350 degrees. Bake the coffee mugs and glassware for 30 minutes. Turn the oven off and allow the coffee set to cool naturally with the oven before removing them. IMPORTANT: YOU MUST PUT THE COFFEE MUGS AND OTHER GLASSWARE IN THE OVEN BEFORE YOU TURN IT ON TO PREVENT THE MUGS FROM BREAKING. Once the paint has cured on the DIY coffee mugs, they are top-rack dishwasher safe. You can now enjoy your new DIY coffee mugs! Keep them for yourself or turn them into a gift for a friend. You can even raffle them off as a fundraiser like I did. Ideas to make it a DIY gift. 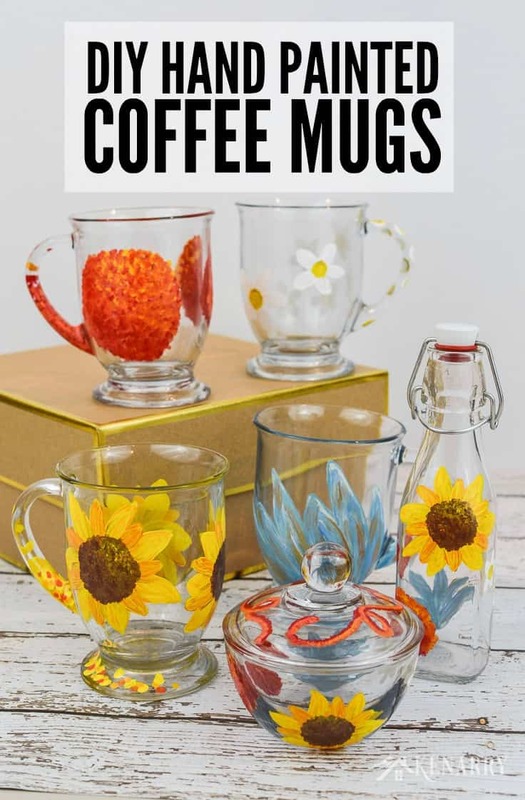 These DIY coffee mugs would be a great holiday, hostess or teacher gift. You could give the glassware as is or turn it into a fun gift basket. Fill the basket with gourmet coffee or tea, small cookies, chocolates and other delicious goodies. You can also add colorful napkins, print these cute coffee note cards or make a set of coasters to go with the coffee mugs. 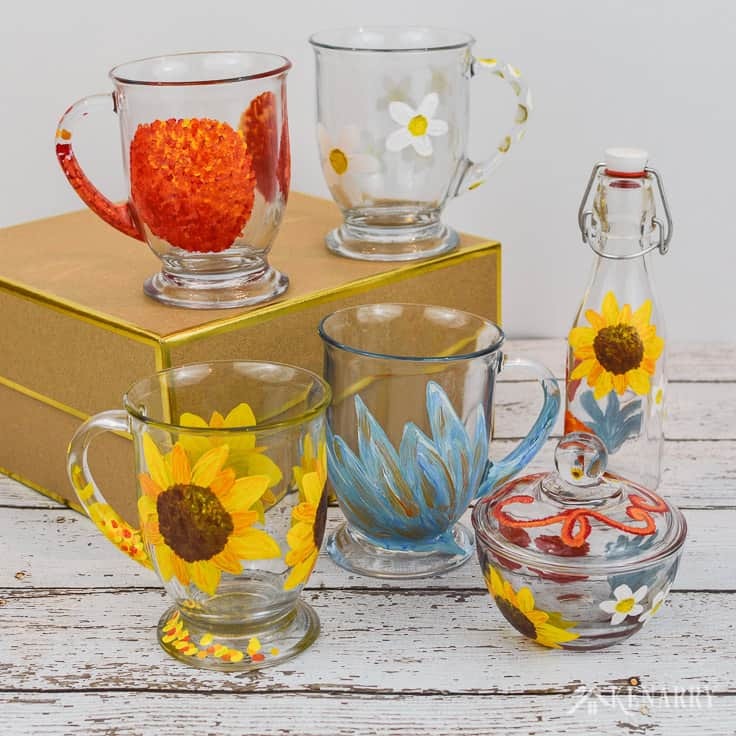 I would like to purchase a set of sunflower coffee mugs, how can I place an order? 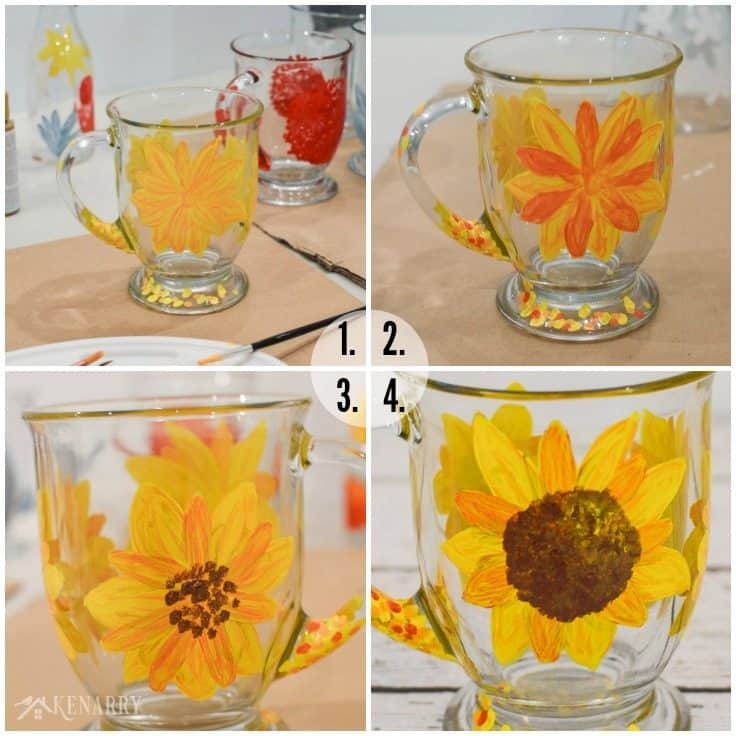 I’m so thrilled you love the sunflower mug I painted. Unfortunately I do not offer them for sale, but you can easily make your own using this tutorial. Nice coffee mugs. These mugs would be an ideal gift to family and friends who love their daily cup of tea or coffee. I’m sure it will always bring smiles to their faces every time they use it. Thank you, Gloria! We completely agree. These would be awesome DIY gifts for friends and family. Thank you so much, Jadesara! They were so fun to make!